Mount Nebo, named for the biblical mountain of the same name, is the highest and southernmost mountain in the Wasatch range. It stands at the south end of Utah Valley, enticing the would be hiker to explore its heights. The summit ridge has three distinct points, the North, South, and Central Summits, with each one soaring over 11,800 feet in elevation. Until several years ago, the South Summit was believed to be the highest, and most routes lead to that point. A recent survey, however, placed the North Summit higher, and several routes up it have emerged. 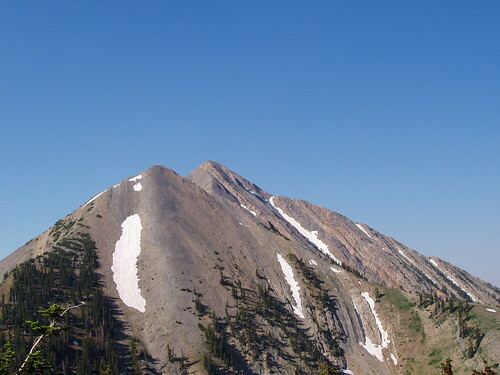 North ridge of Mount Nebo, as seen from the east slope of North Peak. In my personal goal to climb the Seven Peaks of Utah Valley, Mount Nebo was the last mountain on my list. It isn't as popular as some of the other peaks, and a little farther out of the way, so finding time and partners was harder than previously. In the end, two of my brothers, Nathan and Brigham, were able to go with me up the mountain. Feeling adventurous, we choose one of the routes to the North Summit, and made an attempt. Our hike to the top of the Wasatch began at the Monument Trailhead on the Nebo Scenic Loop. To get there, we drove to Payson, and turned south on 600 east, which eventually goes up Payson Canyon. Once on the loop, we made pretty good time, except for the half-hour delay while waiting for a film crew working on car commercials. It is 25 miles from the beginning of the Nebo Loop to the trailhead, which is well signed. We parked in the main parking lot, but additional (and closer) parking is available a short way down the well-maintained Mona Pole Road. We hit the trail shortly after 8am, following the Mona Pole Road to the "real" trailhead. Once there, the trail immediately begins to climb, as it follows a barbed-wire fence along the north side of Hell Hole. 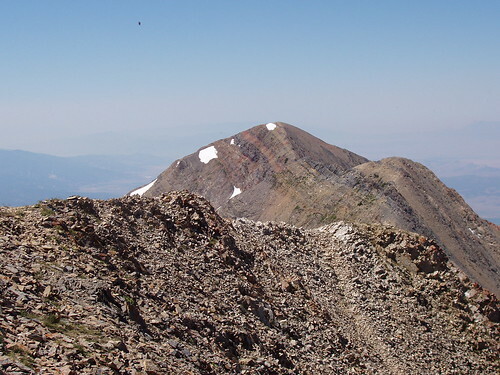 The basic route for the hike consists of following this ridge to the base of North Peak, climbing a drainage to the east flank of North Peak, cutting south to Wolf Pass, and then making the final climb to the North Summit of Nebo. For the first leg, going to base of North Peak, the trail is mainly flat, with a slight dip as it drops to the saddle beneath the peak. From the saddle, we continued to go west toward North Peak. Once at North Peak, we entered a drainage on the north slope. The trail up this drainage is steep in places, and features several switchbacks leading to a ridge above. Once we got to the ridge, we followed it for a few hundred yards before we began contouring south on the west slope of North Peak. From here, the North Summit of Mount Nebo comes into view, with the imposing north ridge plainly visible. We continued going south around North Peak, eventually descending a couple hundred feet to Wolf Pass. The trail to this point was generally on soil, with few trees for cover. Middle and south summits of Mount Nebo, as seen from the north summit. From Wolf Pass, the climbing began in earnest. We were only ¾ miles from the summit, but we still had over 1,300 feet to climb, mainly over rock. The route simply follows the ridge as it goes up and crosses over a couple of false summits. Although the Forest Service does not advertise this trail as being maintained, it was generally easy to follow, even if it did occasionally require come scrambling. We made slow progress, mainly because Brigham was feeling some of the effects of the altitude, but eventually we prevailed and made the summit. Even though we were standing over 6,000 feet above the valley floor, the views where somewhat less than spectacular. With a high pressure system parked over the area, the valley was hot and hazy, blocking anything more than a few miles away. After signing the summit register, eating lunch, and taking a few pictures, we began our descent. I wanted to make the hike a loop route by continuing south along the ridge to the Middle and South Summits, and then down to the Nebo Bench trail, but I was vetoed and we began the descent the way we cam up. Such a loop would be very feasible for the experienced hiker, and would offer a chance to seem much more of the mountain. It would at about 5 miles to the hike, though. We descended back the way we came, although it took only slightly less time than going up. The trail is steep, and and rocks and dirt make it easy to slip while going down. After going down to Wolf Pass, we had to climb the few hundred feet as we contoured back around North Peak. By this point, the day was getting warm, and I were grateful for the extra water which I brought, as there is no water available on the trail. We met the only other person we saw on the trip while descending the drainage on the north side of North Peak. Once we descended that, it was only a couple miles of undulating terrain until we were back at the car. Overall, the hike was rugged and strenuous, but not overly long. I would like to go back sometime and hike some of the other routes on the mountain, possibly a loop to the South Summit. In the end, though, the North Summit of Mount Nebo was a great way to finish off the Seven Peaks of Utah Valley.